80's Vibes, Race Car Lines, and New T Shirt Designs: What Do you Think Fellow Opponauts? I love BBS Turbo Fans on 935Ks and 80's colors so I put them on t shirts. Designing these shirts is fun and I have done a few other styles and cars. I wanted to see what you all thought and if there are any other cars you would want to see done in a similar style. The 991 Porsche GT3 is a beast of a car from the factory. Packing a flat 6 engine that pushes out 475 HP and revs to 9000 RPMs. The road going track derived model is a media darling and is one of the best road cars on sale today. So can the aftermarket really improve on German precision? Hello Opponauts! I know some of you read my article on the Aircooled Kult of Luftgekuhlt, if not read it HERE. Well, one of the great Oppo members and Aircooled 911 owners produced this awesome movie about the Targa Baja. The Ferrari F40 is a one of my all time favorite cars. A race car built for the street and the first production car with a top speed over 200mph. Enjoy and follow me @motoraffair on Instagram for more car art daily. One of my favorites from a HRE Wheels shoot I did some time back. In my opinion the perfect set of wheels with the right stance, a timeless beauty. Enjoy! Summer is ending, time to enjoy the sunshine before things get cold. What better way to soak up the rays then with the top down and a V10 screaming in your ear? Cheer up your Monday with this pair of Audi RS5s. The image should be big enough for wallpaper use. Enjoy! Choosing My Next Driver's Car: Kicking Godzilla to the Curb! I am looking to make a change in my garage and find my next driver’s car. 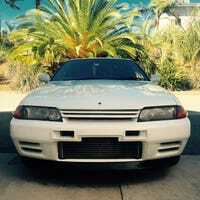 I currently own a 1990 Nissan Skyline GTR(recently imported from Canada and strongly tuned with 500 hp), a 2003 Mitsubishi Evo VIII(with basic bolt on mods 350 hp) and a family hauler 2007 BMW 530IX Wagon(wife’s car).